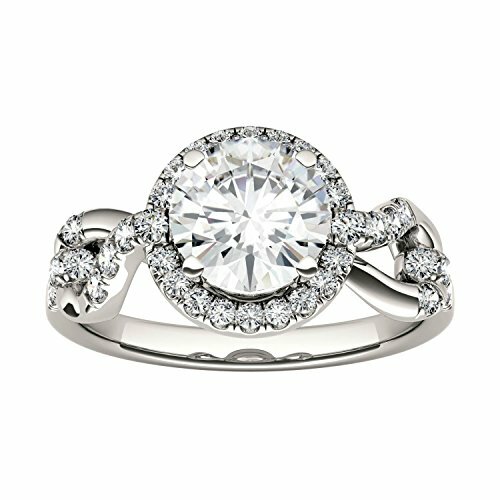 This beautiful Forever Brilliant ring showcases a 6.5mm round brilliant cut moissanite gemstone. For extra sparkle, the band is accented with thirty-eight 1.3mm moissanite gemstones. The sides of the ring feature a lovely infinity design. Beautifully crafted in rhodium plated 14K white gold and secured in a four prong setting. Ring size 7. The primary 6.5mm gemstone has a Diamond Equivalent Weight (DEW) of 1.00ct (Actual Weight 0.88ct). The total Diamond Equivalent Weight (DEW) including all thirty-nine gemstones is 1.38cttw DEW (Actual Weight 1.18cttw). This beautiful Forever Brilliant ring showcases a 6.5mm round brilliant cut moissanite gemstone. For extra sparkle, the band is accented with thirty-eight 1.3mm moissanite gemstones. The sides of the ring feature a lovely infinity design. Beautifully crafted in rhodium plated 14K white gold and secured in a four prong setting. Ring size 7. The primary 6.5mm gemstone has a Diamond Equivalent Weight (DEW) of 1.00ct (Actual Weight 0.88ct). The total Diamond Equivalent Weight (DEW) including all thirty-nine gemstones is 1.38cttw DEW (Actual Weight 1.18cttw).